Established in 1997 in rural Chester County, Pennsylvania, Farm at Coventry grew organically from a need to use the abundant harvest of Susan’s herb gardens to make beautiful, healthful products to share with family and friends. Showing others how to grow and create simple herbal remedies for their own family needs proved to be both enjoyable and empowering. 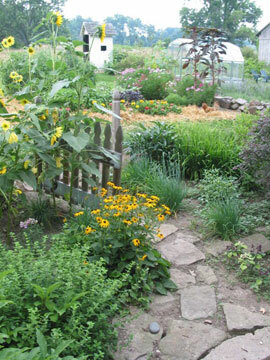 Susan began teaching her first “Homestead Herbalism” foundation course in the Spring of 2002 meeting one day per month. It grew from a 7- month course, expanding to 9 months and finally to its current 12 month course format. The course curriculum weaves current informative herbal wisdom with interesting historical facts and folk traditions. Through the seasons, from planting through harvest, participants learn to create delicious, nutritional foods as well as therapeutic preparations using edible, medicinal and fragrance herbs that are both cultivated and wild crafted. In the not too distant past, keeping a family strong and healthy with simple home remedies was a common homesteading skill that every woman possessed. Identifying and using wild and cultivated plants was as important and necessary as preserving food or learning to stitch. The “Homestead Herbalism” foundations course was designed to gather small groups of people with the intent of re-introducing this empowering tradition by learning together, using our hands, and preparing and sharing the harvest. For those who wish to experience a taste of the course, the “Community Workshops” are individual classes that are offered around the area in PA and NJ.